Your past need not define your future – there’s always an opportunity for reinvention! I have a fellow now working to organize all of the quotes that I’ve been doing on a weekday daily basis here since late 2016. There are now over 800 of them! More news to come on what I will be doing with them in the future. Suffice it to say, people are inspired by the thoughts expressed here. And so this concept is one of my favourites – there’s always time to undo what you have done, to fix what you have broken, to heal what you have damaged. There is always an opportunity to redefine the product or service you sell by coming up with a new one. You can always reinvent your past for a better future. There’s always opportunity for a redo! 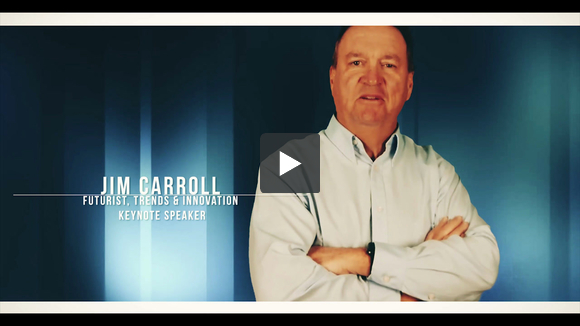 Pre-Event Video: The Acceleration of Medical Science and Healthcare! In May, I’ll be the opening keynote speaker for the American Association of Orthopaedic Executives/ American Alliance of Orthopaedic Executives annual conference in Nashville, with a talk on the future of healthcare. Learn more about the event. Clients that book me have the option of getting some advance insight out to their people to get them excited about the event. So I filmed this. Interested in something similar for your event? Need to break through the noise with your own event promotion? Read about how you can do just that on my Event Promotional Video page. If you are on the tee box, looking at river, pond or hazard to cross, and you think about the trouble you are in, guess what. You’ll go in! My son would watch me at #11 on my home course, Credit Valley, where we cross a river. My entire swing pattern would change; I would tense up, wind up, try to kill the ball. I’d slice left, and donate another ball to the river-god. I’d even start to worry about the river long before I got to the river. And after I went in a 2nd time, I’d have to go sit on the “Bench of Shame” on #12. Kudos to @bonesstabone for naming the bench. It took a few years, but I like to think I’ve learned to approach the hole in a very different way. Our season doesn’t start for a few more weeks yet so I’ll discover that soon. But today, I’m playing at Doral, which is full of water. It’s mindset over H2O today. The same type of thinking can you hold back in business and in your personal life. If you set out with the idea of failure in mind, it’s pretty likely that you’ll fail. world class innovators who learn faster from faster failure master faster markets! lesson? World class innovators master faster markets because they master fast failure! So there are really two types of failure that you might encounter in your life: predictive obsessive failure, and experiential failure. My golf shot over water? Predictive obsessive failure! The hours I will invest in my short game to master bunker shots and chip shots? Experiential failure! On stage yesterday in San Diego for the KalmarOttawa North American Dealer meeting. Thank you Erica for the great photo! What if your world changes – you used to sell highly specialized trucks based on gas and diesel, but might one day be selling highly intelligent, autonomous self-driving, self-diagnosing connected vehicles that run on electric? And you are no longer selling just a truck, but a self-diagnosing service level uptime guarantee? That’s what happens in a world in which we head into the future. Over the years, I’ve done many dealer meetings – Volvo, Mac Trucks and others. I do a lot of talks for transpiration companies struggling to align to the era of acceleration – Mercedes Benz, Chrysler and others. The transportation sector is seeing themes massive change since the invention of the Model-T! And so while there is a lot of talk of the need for innovation, the proper strategy involves much more than that – transformation. Sometimes tinkering with new ways of doing things is not enough – you need to do entirely new and different things. ‘Transformation’ is a great motivational word, because it implies and involves complete and fundamental change. “Transformative change.” And it’s often necessary to deal with the era of acceleration. And it’s critical at a personal level too. Have you tried to fix things in your life with a lot of new ideas, but find that they don’t stick? That you soon end up following old bad habits, routines and actions? Think transformation – take a big and bold step into a new world of fundamental and complete change. I’ll often point out on stage that we can consider innovative thinking from 3 perspectives: doing things better; growing our activities; or transforming them altogether. Daily Inspiration: Are You Fred, or George? Your answer probably matters. Are you stuck in the past when the future is hurtling at us with staggering speed? If you follow me, you’ll know I often tell the story of the time that the Jetsons met the Flintstones. That cartoon scene defines much of the world today. On stage, its’ a significant challenge! Today I’m speaking at a dealer meeting for a comply in the transportation space. I know I’ve got a lot of folks in the room who won’t like the inevitable trends I will talk about – #selfdrivingcars, #autonomousvehicles, #electricvehicles and more. They won’t like it because the future represents a threat to what they sell; it involves change; it takes them out of their comfort zone. That’s a natural human reaction to change. Some of the folks in the room will have an open mind, and will be of a mindset that they need to start aligning themselves to future opportunities. Yet others won’t – they’ll view my message with hostility, anger, negativity. The interesting thing is that the future is going to happen to them, regardless. Will you hang out with Fred Flintstone while he toils away in a future based upon coal, or are you George Jetson, firmly aligned to a future that involves wind, solar, renewables, microgrid, electric vehicles? Sometimes people wake up to a new reality, and the seven stages of grief kick in. Welcome to Monday – it’s a whole new world! Often the hardest thing to go through, and staying motivated, is when you expect a certain result, only to have a different outcome. To build up your hopes for one conclusion only to see the story turn out with a different ending. When the reality TV shows suddenly becomes all too real. Lots of folks today will be struggling, perhaps a little more on this particular Monday. What should you do about? Talk with your friends. Share. Open up. Discuss the situation. Take some time to digest it. Don’t jump to rash conclusions. The story might not even be over yet. No one really knows.